There are some books that you want to reread as soon as you finish them. Books that take your breath away and shock you. 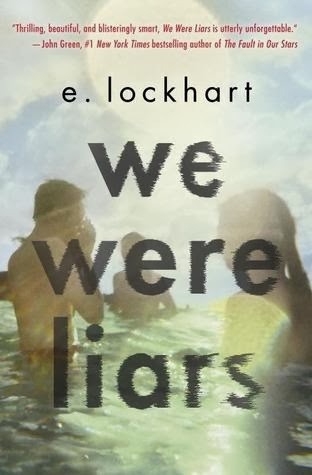 My queen, E. Lockhart's latest, We Were Liars, is one of those books. The gorgeous, wealthy Sinclair family has everything going for it, living in their own world on Beechwood Island. But, of course, there is much behind the facade. Part fairy tale, part tragedy, this is a book that will haunt you. As always, I loved Lockhart's writing. Her description of the family home pulled me in and made me want to curl up in a pile of golden retrievers. "It is full of original New Yorker cartoons, family photos, embroidered pillows, small statues, ivory paperweights, taxidermic fish on plaques. Everywhere, everywhere are beautiful objects collected by Tipper and Granddad. On the lawn is an enormous picnic table, big enough to seat sixteen, and a ways off from that, a tire swing hangs from a massive magnolia tree." I want to disappear into a world of Lockhart's creation, and for awhile, I was able to do so. It's essential to go into We Were Liars unspoiled, so I will leave it at that. Read this book. Then, read it again!